We believe in homeschooling. That’s why HSLDA launched the Academy in 2009 as a service to its member families and others who are looking for ways to supplement their students’ high school education. We want to help make your job easier as homeschooling parents by offering online courses in subjects that can be difficult or time-consuming to teach. Solid academic preparation. Your students will not only grow in knowledge but also develop good study habits and time-management skills to prepare them for college and beyond. Biblical worldview teaching. Each of our courses is taught according to a biblical worldview. Our Christian instructors are dedicated to helping your students mature academically and spiritually. Quality teaching and feedback on assignments. Our teachers lead weekly virtual class sessions, provide grades and feedback, and answer your students’ questions throughout the course. What courses can your students take? 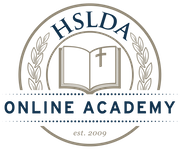 HSLDA Online Academy offers courses for students at the 8th through 12th grade levels. Each of these courses is designed to help students master the fundamentals they’ll need to succeed later in college and beyond. We offer nine courses designed to prepare students for the College Board’s standardized AP® exams, which are administered at local schools every May. We recommend our AP® courses for 11th and 12th grade students, or advanced 10th grade students. 1. AP® courses can save you time. By taking one of the Academy’s AP® courses and earning a high score on the AP® subject exam, your student can qualify to earn credit or skip prerequisite courses at most colleges across America (and colleges in many countries around the world). Earning this credit early could allow your student to finish college earlier and save money on tuition and room and board. HSLDA Online Academy students have a proven track record of high AP® exam scores. To see how our students have performed in the past, please see our score results page. 2. AP® courses can save you money. Earning college credit for an AP® exam score means you don’t have to pay for that credit in college. Many college courses cost 3 to 6 times as much money as any of the Academy’s courses. That’s more money in your pocket now so you can help your student save for college later. 3. AP® courses can get your child into his or her college of choice. College entrance can be tricky. College admissions committees like AP® courses, because they show that your student is ready for challenging, college-level coursework. In addition, AP® courses are worth more GPA points on your student’s high school transcript. Challenging coursework and a higher GPA can make your student’s high school transcript stand out in the college admissions process. How much do the Academy’s courses cost? For a full summary of our tuition costs and refund policy, please see our tuition page. HSLDA members receive $50 off each one-semester AP® course and each regular high school course and $100 off each yearlong AP® course, no matter how many courses your student takes! To join HSLDA, click here.